You all have probably heard the term DECT before or cordless DECT 6.0 before. All you simply have to do is walk in your local Best Buy, Wal-Mart, or Target and browse the aisle that contains telephones and other electronics. DECT has actually been around for quite some time now, predominantly in the analog world. DECT stands for “Digital Enhanced Cordless Technology” and facilitates a cordless or wireless communication between a base and handset or receiver via a 1.9 GHz frequency range. In most cases, you get around 300ft or so of DECT signaling from the DECT base station. This means that you have a 300ft circumference around that particular base to enjoy cordless freedom. For the majority of IP DECT solutions, the range doesn’t stop there. These solutions can be accompanied by DECT repeaters which simply transmit the DECT signal strength another 300 ft outwards. In most cases, these DECT repeaters must all reside within the main DECT base signal frequency. Please see the diagram below which shows this graphically. 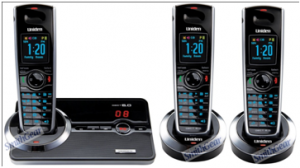 If you currently are using a cordless telephone at your home, most likely it is communicating with the base over DECT frequency much like the below Uniden phone does. DECT doesn’t end with cordless analog telephones, more recently, DECT 6.0 technology has been used to facilitate a wireless communication link with a headset and base station. 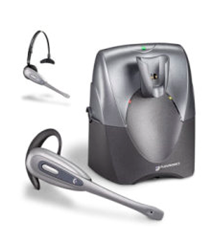 Take for instance the Plantronics CS540 cordless headset, the actual headset pairs to the headset base via DECT frequency and allows users to easily make and receive calls wirelessly over this frequency. This adds greater mobility and flexibility to any professionals daily work activities. Most recently, DECT technology has been absorbed by the IP world, predominantly the Voice over IP world. The solution’s presented work much like the cordless analog solutions you find at your local electronics store but instead of using older analog telephony communications, the IP DECT solutions present an RJ-45 Ethernet connection for facilitation of VoIP telephony instead. Also with most IP DECT solutions, you can add up to 6-8 cordless handsets (depending on the manufacturer), each with their own SIP extension to 1 base unit. Greater Mobility and flexibility– users are not tied down to their desks or the workspace where their traditional phone or VoIP Phone may sit. With DECT, users can freely move about the office or home, make and receive calls, and improve productivity. With all DECT solutions, you have ability to pair additional handsets to the solutions. These could be individual SIP extensions or each could be same as part of a ring group. 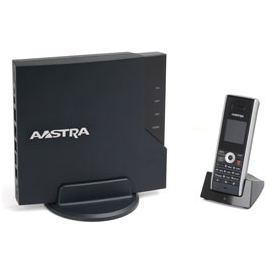 Also, with DECT each handset paired to the DECT base has the ability to easily intercom any other handset paired to that same base. DECT 1.9 GHz Frequency- since DECT facilitates the wireless communication link between base and handsets on the 1.9 GHz frequency; you won’t have to worry about any interference from other Wi-Fi devices as these predominantly use the 2.4 GHz range. Also, the DECT frequency is fully secured so you won’t have to worry about Wi-Fi encryption, security measures, or hassles presented on SIP Wi-Fi handsets when trying to connect to secure Wi-Fi Access Points or Hot-Spots. Seem less Roaming- in most Wi-Fi environments, the Wi-Fi network may consist of many Wireless Access Points or AP’s that may contain unique SSID’s or many AP’s may share 1 SSID such as in a mesh wireless setup. In both setups, traditionally, Wi-Fi handsets have a tough time negotiating AP signal hand-offs. This occurs when a user physically moves between each Wi-Fi AP’s signal ranges. In most cases, if you are on a call, it may drop, essentially because the handset can’t seamlessly carry over its Wi-Fi connection which is facilitating its SIP registration to the PBX or VoIP Provider. Another shortfall is that these handsets may lose registration to the PBX because of this hand-off issue or the user may simply be out of Wi-Fi coverage area. The bigger issue is that the handset doesn’t signify any problems and user has no idea that their handset is not registered any longer. This causes huge issues in mission critical environments such as medical. With DECT solutions, you don’t have any hand-off or roaming issues because the DECT base and any additional DECT repeaters are all on the same 1.9 GHz frequency and no unique SSID’s are needed. The handsets simply pair to the base and inherit the frequency broadcasted by both the base and additional repeaters. Also when a DECT handset reaches its limits, that being its DECT frequency range, it will signify to the user by beeping loudly to let them know that they are moving out of DECT frequency. Better Voice Quality or Quality of Service (QOS) – In my experience with Wi-Fi handsets on a local Wireless network or public hotspots, the voice quality observed is mediocre at best. While many end users come to expect “cell-phone” like voice quality, the common misconception, obviously is to blame the Wi-Fi Handset. However, in actuality, it’s the Wireless network or AP these handsets are connected to that cause Voice quality issues. Let’s assume you are using a wireless LAN in an office environment, and you have both SIP VoIP Wi-Fi handsets connected to the network as well as laptops. So you have voice and data traffic on this network. While there are suggested ways to segment voice and data, ultimately what happens is, bandwidth on the WLAN gets depleted by data devices, not leaving enough for voice calls. When a user attempts to make a VoIP call, they are presented with very poor voice quality as voice packets are being dropped, packets are being delayed causing latency, and scrambled causing jitter. All of this equates to poor voice quality and you know as much as I do, this cannot happen. The same is true on Wi-Fi public hotspots, if not worse than the private WLAN. Most hot-spots where intended for data, not voice, and most hot-spots can handle a large number of users. Take an airport for instance, while you may experience slow internet speeds on your laptop, this is feasible as the website page still loads, it just takes longer than normal, and you still have access to your precious email. This slow speed is attributed from the amount of bandwidth available on the wireless network and the amount of data users on the network. This same latency (website pages loading slower than normal) is also seen and heard on SIP Wi-Fi Handsets causing very poor voice quality. Now enter in DECT, since it runs on its own frequency, there is no so called bandwidth allocations like Wi-Fi networks need to accompany voice. DECT voice quality cannot be affected by any data intensive applications on the network since it’s on its own frequency. In all, DECT solutions prove to have much more reliable voice quality than Wi-Fi solution mainly due to its architecture and its own designated frequency. Longer Battery Life- This is kind of a no-brainer. In most Wi-Fi environments, Batteries have a tendency to drain quickly because the handset is constantly looking for a wireless signal or AP, causing more power and resources from the handset, thus draining the battery quicker. With most DECT solutions, users enjoy longer talk time and stand-by times as it relates to battery life. The handsets are paired once to the DECT frequency and that’s it, no more searching for signal, unless you move outside of the DECT signal coverage.